With the Straßenbahn in their DNA, the Vienneseare abandoning their cars for public transport and looking forward to robot chauffeurs. Bumper to bumper, the motorcade makes itstortured way forwardalong Vienna’s Gürtel, dividing the inner nine districts from the rest of the city. Packed into three or sometimes four lanesin one direction, motorists curse and shout, as all the frustrations of the day come pouring out. As the light turns from red to green, a sports car squeals into the intersection. It is on these streets that the most toxicgases are pumped out into the atmosphere. This is not a new problem: In cities all over Europe, discussions have long been under way about how to get automobile exhaustfumes under control. Already a health crisis,they are damaging people’s lungs, hearts and circulatory systems, and emissions are a cause of death in over 11,500 cases a year, according to Environmental Health Analytics in Washington. The solution, most experts agree, is electrically powered vehicles. In Vienna, they’re here already. They’re called trams. There used to be a tram line on theGürtel: It was Line 8, which ran for 82 years from Meidling to Lichtenwerder Platz. With the modernization of the“elevated,” which was joint to the subway system in 1989 as line U6, the city stopped running street-level trams along the Gürtel. Residents fiercely opposed the change: Surveys showed 90% of participants in favor of keeping the line. But it didn’t matter. The line had to go, and the questionnaires disappeared in the drawers of the Rathaus. The city had long since decided in favor of the automobile: A traffic plan from 1969called for the trams to be replaced by subway lines, and over time, even with no subway replacement, on the street level, to make way for buses and cars. Some more radical proposals – like a freeway exit directly at Karlsplatz just below the Opera– were thankfully shelved. But on the whole, the plan has largely been followed: tramlines 23 and 25 along Praterstraße gave way to the U1, lines 52 and 58 to the U3 line on Mariahilfer Straße, the 21er to the U2, and the 67er line to the U1 to Oberlaa, etc. There were invariably protests. But always in vain. Things look different now. Almost 30 years since the “8er” was discontinued – and mourned – 15th district counsilor Didi Zach, of the Wien Anders political club inRudolfsheim-Fünfhaus, collected more than 1,300 signatures and filed an application in the Bezirksparlament (district council) for the re-introduction of the No. 8 tramline. The support was immediate and unanimous. All along the “8er,” district leaders spoke out for their Bim, wrote the Wiener Zeitung in October 2017. In early March, Didi Zach, his collar open, his tousled head uncovered in spite of thedamp, stood on the walking and cycling path along the Gürtel next to the U6 stationThaliastraße. “This was the track,” he said. “I often took the ‘8er.’” He would get on atthe Sparkassaplatz station in the 15th district near where he lived and head for work, to meet friends or go out. But nothing about transportation is easy and even with the overwhelming support atthe district level (48 out of 50), the application has gone nowhere. The district councilleader never passed it on to the city councilor for Transport, Ulli Sima (SPÖ). The construction of the tram network has always been a thorn in the side of the powerful. The first tramline opened in 1865and operated by the private company CarlSchaeck-Jaquet & Compagnie, was pulled by horses and ran between Schottentor and Dornbach. 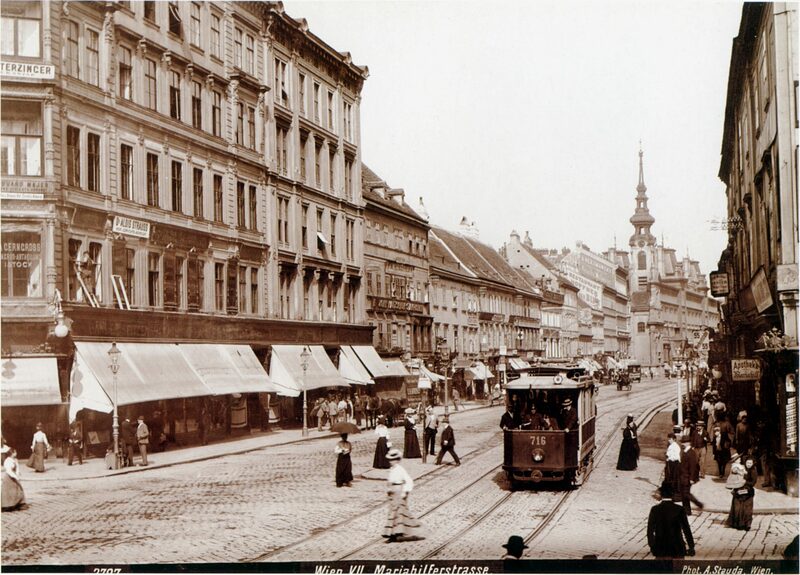 Just 18 years later, in 1883, the first steam-powered tramway opened between the Viennese suburb of Hietzing and Perchtoldsdorf, south of Vienna. Another 14 years later, in 1897, the first electric tram ran on the tracks of today’s No. 5. Less noisy and smelly than either horse or steam, the electric tram was finally pushed through. But by then the horses had already retired: On June 26, 1903 the last horse tram carried passengers along Liechtensteinstraße. The expansion of the tram system wascomplicated by Kaiser Franz Joseph, who did not want to spoil his beloved Ringstraße or the Mariahilfer Straße with overhead power lines. The private owners tried battery power, but passengers complained of acid fumes rising into the cars. The “pans” transferring the power were then placed in the rails. But that didn’t work either, causing frequent breakdowns and interruptions in service. Eventually the city simply ignored the Kaiser, by then old and frail and distracted by the war. From 1915 on, the trams ran on overhead lines. Over time, the city took over the running of the trams. Following the First World War, the network was expanded to become one of the densest in the world, with its largest rolling stock amassed in 1928 – more than 1,500 motored engines and 1,900 second cars. 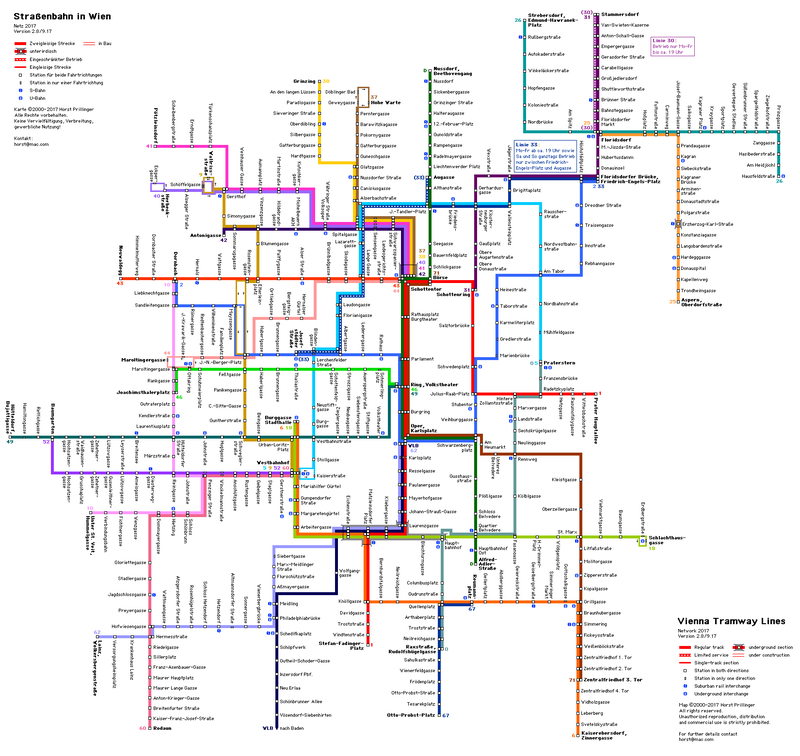 The largest expansion of the system was reached the following year, a tram rail network of about 318 kilometers. After the Second World War, the tram was increasingly perceived as a space problem, and following the spirit of the times, the city government set out to build a car-friendly city. Tramlines were closed, and public transport went increasingly underground. Buses were to gradually replace the trams. But among the Viennese, the spirit of the streetcar lived on. 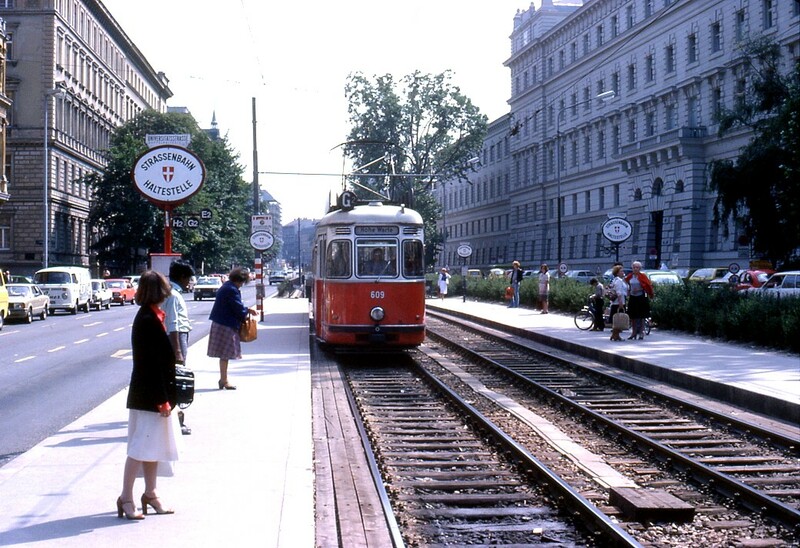 “The affinity for the tram is particularly important for Vienna,” says Hermann Knoflacher, a specialist in traffic planning and professor emeritus at the Vienna University of Technology. Now 77, Knoflacher developed transport concepts for Vienna, Graz and Hamburg as well as served as transport adviser for the Europe an Commission. Other projects, such as a controversial exit off the Südosttangente, Vienna’s most heavily trafficked commuter highway, were also stopped after protests. However, on most street and highway projects the city prevailed. The car became an important part of city life and many Viennese became motorists. This helps explain the heated battles over the traffic reduction plan for the Mariahilfer Straße four years ago. Now adapted to the automobile, many could not imagine a city in which the car played only a minor role. It’s a case study worth reviewing: Mariahilfer Straße is the main shopping street in Vienna. When the City Counselor for Transit Maria Vassilakou (Green Party), launched a plan to divide the street into a mixed-use zone, with a “meeting” or Begegnungszone, and a pedestrian zone – a heated political battle broke out that reverberated across Austria. From Vorarlberg to Burgenland, it was rumored that civil warlike conditions prevailed in Vienna, that opponents had chained themselves to barriers along Mariahilfer Straße. For over a year, Vassilakou was sabotaged by the opposition, insulted in the street by passers-by, even receiving death threats on social media. According to the newspaper Kurier, a member of the ÖVP Business Alliance diagnosed her with brain disease in a Facebook post, recommending a lethal injection to take her out of her misery. In the end it came down to a referendum. The public voted in favor. Today, the automobile is losing its appeal among the Viennese. Fewer and fewer commute by car, and new vehicle registrations are dropping – down 1.8% in 2014 over 2013, while the population grew by more than 25,000. At the same time, public transport, cycling and car sharing are all thriving. One of Vassilakou’s cherished projects, a Wiener Linien annual ticket for 365€, or 1€ a day, proved wildly successful. Introduced in May 2012, the number of Viennese with a Jahreskarte skyrocketed, from 373,000 then to 778,000 today. In fact, in 2017 for the first time, there were more Viennese households with someone having a Jahreskarte than someone having a car. The two car-sharing providers Car2go and DriveNow, and the city bike rentals all show growth. The changed attitude is clearly felt at Vienna’s driving schools. In early March, Herbert Wiedermann stood in the lecture hall of his school explaining the rules for right of way. His student drivers were all listening intently. They were mostly middle-aged and no one was under 20 years. “That has changed,” said Wiedermann. “The youngest today are 22, 23, 24 years old.” Quite a different world. Wiedermann started as a driving instructor 35 years ago. At that time, there was no such thing as an 18-year-old who did not want a driver’s license. “Owning a car was important. If you didn’t have one, you were a loser.” Wiedermann could hardly wait. “I crossed off every single day on the calendar until I was finally 18, and I could get my driver’s license,” he remembers. “Everyone went to the disco, but you could only get there with the car.” At night, for most things, there was no other option. The trend away from owning a car is not just a Viennese phenomenon. Similar trends are happening across Europe. The auto industry knows that. 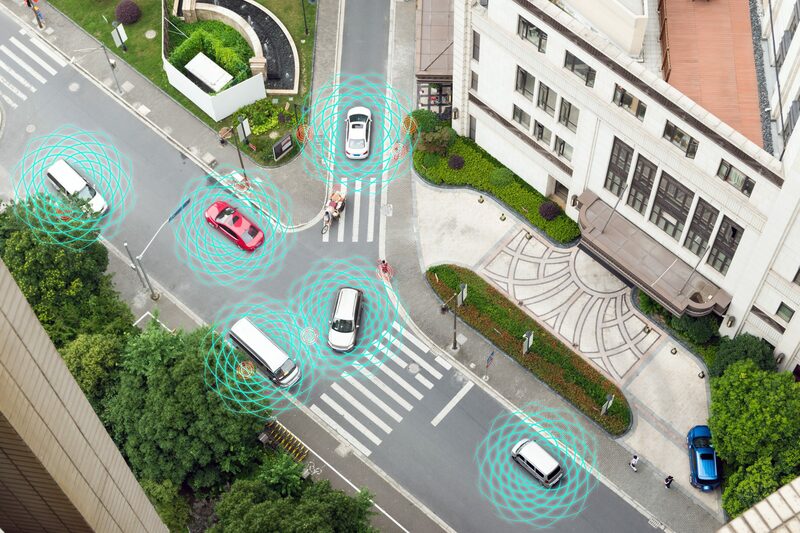 So they have a plan: In addition to public transport and bicycles, they envision cities where driverless vehicles will bring residents to their desired destinations. The race is on, with Google affiliate Waymo, the Chinese Internet group Baidu, along with BMW, Volkswagen, Ford and Tesla all pouring billions into the development of robotic cars. German giants Bosch and Daimler have joined forces in the development of robotaxis, as has Nissan with the Japanese engineering firm DNA, with plans to start testing soon in Yokohama. If the Olympic Summer Games take place in Japan in two years, an automated driving service may well already be in use. In Austria, things are also moving fast. The Styrian consortium ALP.Lab is establishing test lanes for autonomous vehicles on motorways A2 and A9. Heading off for a holiday in Italy, you may soon find one driving next to you. Visionaries like the German Mario Herger tout the huge potential of robotic cars. “More than 1 million people die every year in traffic-related incidents and 94% of these are caused by human failure,” writes the author of The Last Driver License Holder Has Already Been Born (2017). In Austria last year, 413 people were killed and 20,000-30,000 people injured in traffic accidents, almost all car-related. That these were a record low is a grim reminder of the toll our longing for personal mobility still takes. Herger also sees huge potential for cities. “On average, every car in a city drives 36-38 minutes a day and stands the remaining 23 hours, taking in total the urban space of four parking spots – to a cost of 20,000-30,000€ to society.” Imagine, he enthuses, what we could do with all this free space – from parks to shops and Schanigärten. Others like the consulting firm McKinsey are more cautious, forecasting up to 15% of new cars at least partially autonomous by 2030. 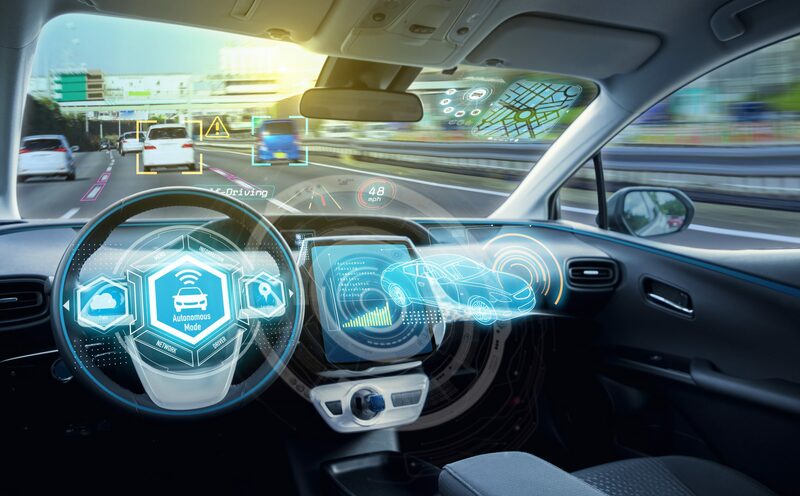 However, industry experts also point to the still formidable stumbling blocks ahead: The biggest hurdle is redundancy – everything from sensors to cables to the network the vehicles need to operate must be doubled and tripled for security and safety. Then there’s the psychological aspect. Do people really trust vehicles driving on their own? How will someone who drove for 50 years react to a car without a steering wheel? And how to finance it all? While Silicon Valley grandees dream of “mobility flat-rates”–instead of paying a one-off €30,000 for owning a car, people would pay €600-1,000 per year for access to car services, they speculate. Russ also points to the formidable technical challenges, both in mixed autonomous and human traffic, and in the legal framework that must evolve in lockstep. Not to mention what people are comfortable with. He sees the perfect “system fit” to shift to an integrated system of autonomous transportation still 50-70 years away. Recently, Elon Musk, the man behind Tesla, presented his vision of a “Boring Bus,” an autonomous vehicle shuttling people on tracks safely through the nightmare that is Los Angeles traffic. As Musk is hailed at home, the Viennese can only chuckle. Their system of “Bus, Bahn, Bim” (bus, subway, tram) does all that the revolutionaries of mobility are dreaming of and has been doing so for decades, and with the trams, a century. Safer, more efficient, more environmentally friendly, often faster, space-saving and, frankly, even more convenient than being stuck in traffic behind your neighbor’s exhaust pipe. So, leave those car keys at home and hop on to the next Bim. The city is indeed yours! In the end, we may all be on a ride back to the future.